The Common Core State Standards, adopted by 42 states and the District of Columbia, call for handwriting instruction in kindergarten and first grade only, and teaching in keyboard skills after that. The standards don’t mention cursive. 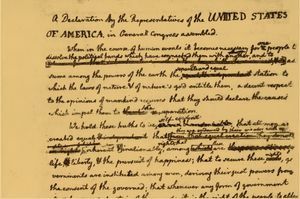 But 14 states require cursive instruction, and the skill inspires fierce loyalty, with some going so far as to argue that the founding fathers would disapprove of our abandonment of the script—students must learn cursive in order to decipher the intent of the original Constitution, for example—and others suggesting that our very identities are compromised when we can’t create identifiable signatures. That bill was signed into law by Gov. Robert Bentley, undoubtedly in a flourish of cursive, and went into effect in May 2016. But it was just one salvo in an old battle that is picking up a new head of steam. In the fall, for example, New York City’s public schools—“the country’s largest school district, with 1.1 million students—encouraged teaching cursive to elementary school students.” And media outlets from The Economist and PBS NewsHour to The Huffington Post continue to write about the revival of cursive, as parents, teachers, and researchers have publicly—and volubly—questioned the wisdom of killing it off. 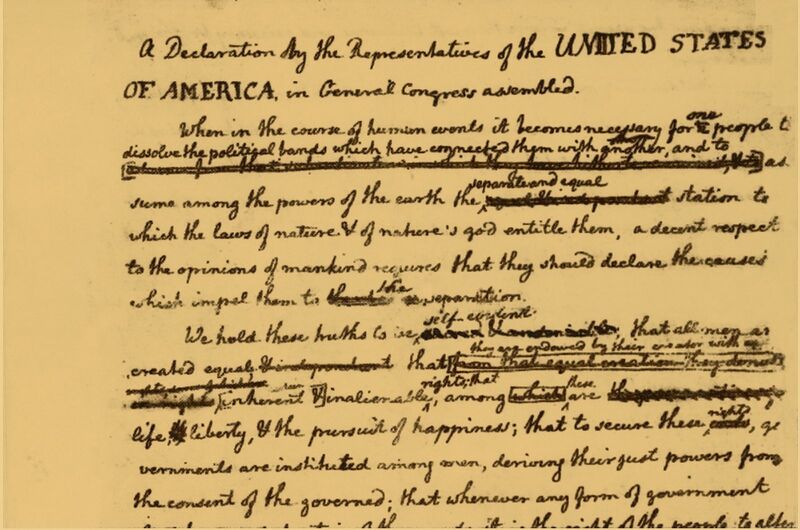 Thomas Jefferson’s draft of the Declaration of Independence, with suggested changes by Ben Franklin. Does the decline of cursive threaten to sever our ties with the past? Is it all just nostalgia, then? Are parents and teachers who are caught up in the controversy merely reliving old glories and trying to resurrect a useless relic? Is the battle over the future of cursive, in other words, really all about the past? Proponents of the script clearly don’t think so. In the case of cursive—and more broadly, handwriting in general—there’s plenty of evidence of cognitive and academic benefits. Brain scans reveal neural circuitry lighting up when young children first print letters and then read them. The same effect is not apparent when the letters are typed or traced. Intriguingly, according to reporting in The New York Times, “block printing, cursive, and typing each elicit distinctive neurological patterns,” implying a deep, underlying sensitivity in the brain to even minor changes in the way letters are rendered on the page. When reading and writing, we appear to be hardwired for versatility. I think your cursive writing identifies you as much as your physical features do. Virginia Berninger, a psychologist at the University of Washington, confirms that point, arguing that it’s not a case of either/or—there are good reasons to teach handwriting, cursive, and keyboard skills. “In one recent study, she and her coauthors reported that cursive in particular had measurable positive effects on older children’s spelling and composition skills”—because cursive is faster than print (though the speed argument is itself a disputed point). And there is some evidence that cursive helps students with dyslexia learn to read and write because it “integrates hand-eye coordination, fine motor skills, and other brain and memory functions.” Other studies broaden the benefits to handwriting generally while suggesting limitations to computer-based literacy, concluding that “teaching handwriting improves students’ composition, reading comprehension, brain function, and motor skills,” and that students who take notes by hand instead of on a laptop process the information better. If these findings are accurate, they form a powerful argument for continuing to teach handwriting, though not necessarily cursive. But digital technology has clearly emerged as a powerful democratizing force, knocking down barriers to access for students with special needs. If some studies show that cursive helps dyslexic students learn to read, for example, others—like a study from the Yale Center for Dyslexia and Creativity—conclude that students with dyslexia will be “big winners” from a switch to keyboarding because that skill helps them improve on the volume of words used, written clarity, spelling, and editing. And there’s another benefit, according to Steve Graham, an education professor who has studied writing instruction for three decades: When “teachers rate multiple versions of the same paper differing only in terms of legibility, they assign higher grades to neatly written versions of the paper.” Keyboards render that deeply unfair bias moot. The continued pace of technological change doesn’t bode well for the future of handwriting—the assault on all forms of manual writing is likely to continue. Artificial intelligence and language recognition are rapidly growing fields, putting powerful, marvelously simple communication tools in the hands of millions of consumers. But given all of the compelling research on handwriting, and the deep cultural and historical meaning of the practice, we should ask whether the Common Core has abandoned the teaching of handwriting and cursive too hastily. As Anne Trubek notes in her book, “We will lose something as we print and write in cursive less and less, but loss is inevitable.” So the question remains: What precisely are we losing—and what is it worth?